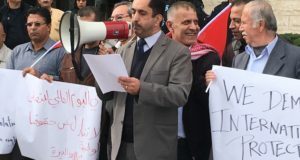 The weekly non-violent protests against the Israeli Apartheid wall continued this Friday in Bil’in and Beit Sira, with Palestinians from both villages uniting once again with Internationals and Israelis in a display of resistance to the ongoing theft of their villages’ land for the construction of the Apartheid Wall. Today’s march was attended by over 500 people, including many Palestinians from Bil’in and Israelis that were injured in the morning action, and International activists. The crowd marched from village to lands destroyed by wall construction, alongside the settlement of Maccabim. Soon, the crowd approached Border Police and Israeli Military, but were able to pass them, despite their shoving and walk around to the adjacent road. A were dismayed to see some of the same border police unit who had shot from close range both Matan Cohen, 17, from Tel Aviv, and a member of the “Anarchists Against the Fence” organization in the eye and Hussni Rayan of Beit Sira . After changing direction and moving onto the road, the demonstrators were able to surround a military jeep by Palestinians with only olive branches, flags and a megaphone against a full array of Israeli weaponry. The Border Police stormed the demonstrators in an attempt to break the peaceful crowd up, using their batons and sheilds to beat the unarmed people as well as throwing sound bombs. While doing this, a few border police fell off the road into the olive orchards and number of people were injured by further Israeli violence. In a few minutes the situation calmed down, and the people of Beit Sira were able to give speeches, discussing the wall and the political situation in Palestine. While this was happening, ISM volunteers observed the border police getting their sound bombs and tear gas ready for use against the unarmed demonstrators. As the protest ended and the people began to walk away, they began their assault, which provoked stone throwing by the local young boys. 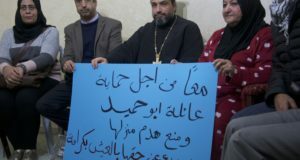 The struggle of Beit Sira will continue, with more protests scheduled for the coming weeks. Activists left for Bil’in after the Bet Sira demo ended, with reports of soldiers entering the village. When we reached we found the IOF was confronting stone throwing youth with tear gas and rubber bullets in a very dangerous manner. About thirty Israeli, International and Palestinian activists then marched towards the soldiers andsucseeded in stopping their firing at the boys. Once they reached the wall, the Palestinians showed court papers to the soldiers supporting their right to access land which has been closed off by the Wall. 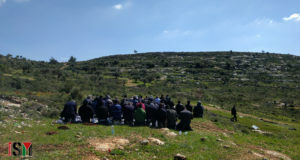 Citing a closed military zone order, the protesters refused to leave and sat down in front of the army jeeps and a large number of Israeli Military. After 20 minutes, the Popular Committee decided to leave the area and return to the village. Some tear gas was fired after the activists’ departure, but for the most part things remained calm. Recently, Bil’in has expanded what is the first Palestinian settlement, located west of the barrier, as well as a second outpost nearby. Abdullah Abu Rahma, coordinator of the Popular Committee Against the Wall, says that they installed the house near the Wall as yet another way to protest against land expropriation for settlement construction and expansion. With over a year of struggle behind them, their will to resist the Occupation and the Apartheid Wall has not diminished at all. The International Solidarity Movement (ISM) is inviting volunteers to come to Palestine for a conference on Joint Nonviolent Struggle in Bil’in and for ISM’s Spring and Summer Campaigns. ISM’s Spring Campaign will take place between March 1st and April 23rd, 2006, and Freedom Summer will be from July 2 until August 5, 2006.